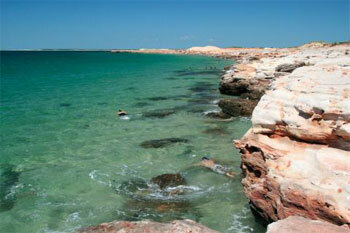 Journey into the Northern Territory's rugged Top End on this short but sweet four-day tour. Learn about Aboriginal and Torres Strait Islander legends and customs during the Top Didj cultural experience, go bird and croc spotting in the lush Mary River and see traditional rock art in Ubirr. Climb high to look down on the Nardab Floodplain and then find refuge from the tropical heat in the swimming holes of World Heritage-listed Kakadu National Park. Discover the history of the First Peoples of Australia at Anbangbang and cruise through the towering rock walls of Katherine Gorge. The reds of the soil and orange of the sunsets will leave you with a lasting impression of the Territory’s beauty and biodiversity. 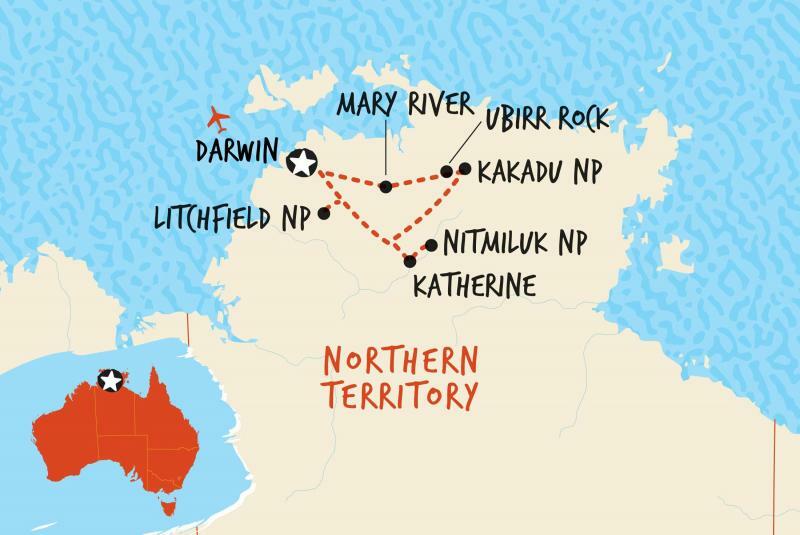 • Welcome to the Northern Territory’s tropical capital. 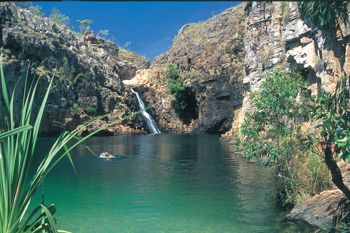 Leave Darwin in the early morning and travel to Litchfield National Park, home to dozens of freshwater waterfalls, tropical rainforest and crystal-clear swimming holes. Don’t forget your swim suit as there will be plenty of time to enjoy a refreshing dip or two as you visit Florence Falls and Buley Rockholes. Enjoy a lovely picnic before travelling on to Wangi Falls for a final swim and leisurely stroll through the monsoon forest. After a full first day, retire to your campsite for the evening with a hearty dinner, where all tents are twin-share and come with a proper bed. • Start the day with a wildlife cruise in the Mary River Wetlands, a network of waterways home to crocodiles and native bird species. In giving Kakadu National Park World Heritage-listing, UNESCO described it as a ‘living cultural landscape with exceptional natural and cultural values’. The Traditional Owners have lived here for more than 50,000 years, to which the ancient rock paintings of Ubirr can attest. Your guide will explain the significance of these artworks during an interpretative cultural walk that finishes on a rocky escarpment overlooking the Nardab Floodplain. Total driving time: • Total driving time today is around five hours. Total walking time: • Total walking time is up to three and- a-half hours, depending on the trails taken. 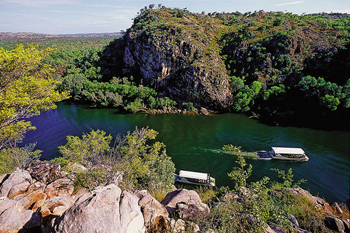 • This morning you have the option to take a scenic flight over Kakadu (at your own expense). The flight takes in views over the Arnhem Land escarpment, vast flood plains and billabongs. Later spend time exploring Kakadu’s other major Aboriginal rock art site – Nourlangie (Burrunggui), while your guide provides a glimpse into how the local Aboriginal and Torres Strait Islander people live. After lunch head south and stop to visit the historic gold-mining centre of Pine Creek. Stop for a quick dip at Maguk or Gunlom Falls, before continuing on to Katherine, where you'll settle in for the night at a private campsite near Nitmiluk National Park (Katherine Gorge). • Back in the day (ok, it was 23 million years ago), the Katherine River flowed all the way from Arnhem Land to the Timor Sea. These days, the waters have subsided significantly: the Katherine River now flows along hemmed in on both sides by cliffs 70 metres high. It’s the highlight attraction of Nitmiluk National Park though, and you’ll have the opportunity to cruise through it by canoe or boat. 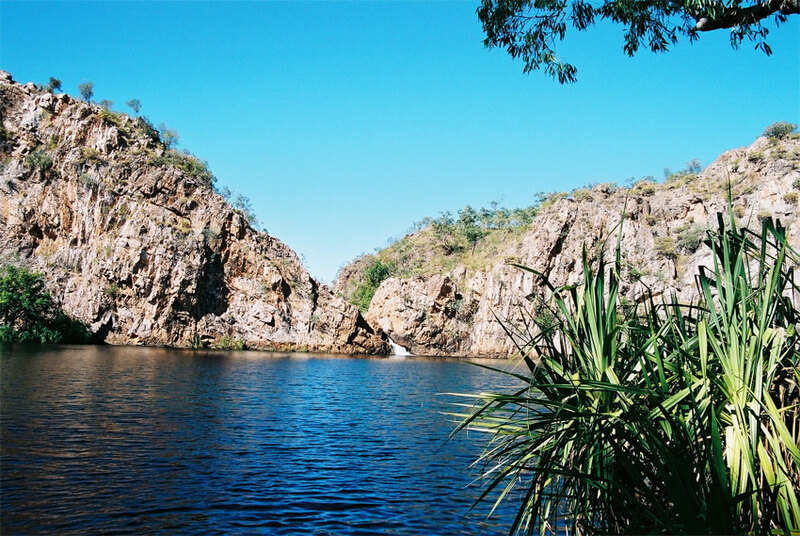 After lunch we head to the beautiful Edith falls for one last refreshing swim in the huge plunge pool before we hit the road back to Darwin, where your adventure comes to an end on arrival. Perhaps enjoy one final group dinner in town and toast to your adventure with your new friends. Total driving time: • Total driving time today is around four-and-a-half hours. Total walking time: • Total walking time is up to three-and-a-half hours, depending on the group's choice of optional activities. 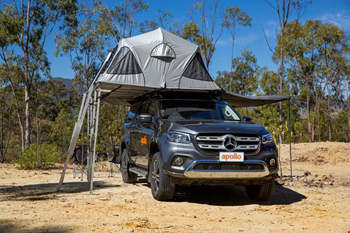 •You'll spend some nights of the trip sleeping in outback camping grounds. While conditions can be basic and facilities are minimal, this is all part of the adventure. You'll need to pitch in with preparing meals and cleaning. •This trip requires a moderate level of fitness as it involves a lot of walking, allowing you to truly enjoy the surrounding nature. Some hikes are longer and more challenging than others. Please bring sturdy, comfortable walking shoes and comfortable clothing. •Temperatures in the Top End can be extreme. During the day the weather can be hot (and the Australian sun is strong) so please bring appropriate clothing, use sun protection and drink plenty of water. In the evenings temperatures really drop, so ensure you have base layers and warm clothing. •This trip has a strict luggage limit of 10kg. Excess luggage can not be carried however, it can be stored at Darwin accommodation. • Original-style camping is in shared permanent twin-share tents that feature cosy beds, wooden floors, full linen, lighting, power points, a bedside table and fans. Shared Bathroom facilities. Those travelling solo aren’t charged any extra if they’re happy to room-share with someone of the same gender. For those who’d prefer their own room, single supplements are sometimes available. * Should any of the attractions on days 1-3 of the standard itinerary not be open as a result of National Park decisions surrounding accessibility and safety, the above listed activities will be substituted. The standard attractions will be visited immediately as they begin to open. The opening and closing of ‘dry season’ activities varies from year to year. 1. Tour commences in Darwin on Day 1 at 6.50 am and finishes in Darwin Day 4 at approx 6 pm. Onward travel must be booked for the following day. 2. Strict luggage limit of 10 kg applies in Kakadu excess luggage can be stored at Darwin accommodation. 3. The opening and closing of attractions is dependent on National parks. 4. Please note no single supplement is available for this trip. This is an true outback adventure experince. We have over 500 real outback Australian experiences for you. Our safairs are tours but with much more emphasis on being eco friendly tours, unique adventures with lifetime memories and destination experiences to rivavl natures best. We have been booking tours for our passengers for over 22 years in the Australian travel and tourism industry and have become the leaders in booking agents in Australia. We have been Territorians since 1988 and locally based in Darwin. So if you want real genuine Australian tour advice from a local then contact us or get a outback safari tour quote from us. Or just ring us within Australia: Freecall 1800107371 or Overseas: +61 8 7999 7511 after 10am. Kakadu and Top End guided small group safaris from Darwin returning Darwin with both camping in permanent tents and private campgrounds. Arnhem Land and Top End guided small group safaris from Darwin returning Darwin with both camping in permanent tents and private campgrounds. Uluru guided small group safaris short on time and fly Alice Springs or Darwin included. These safaris have a mix of camping and accommodation. Kakadu and Uluru guided small group safaris short on time and fly Alice Springs or Darwin included. Mix of camping and accommodation on tour. 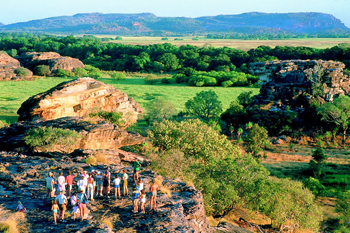 Kakadu guided small group safaris short on time and fly Alice Springs or Darwin included. Mix of camping and accommodation on tour. 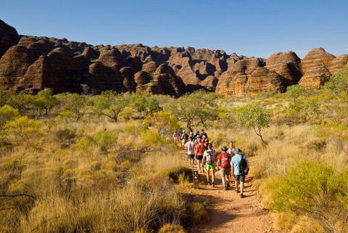 From Cruises, to Nitmiluk, Bungle Bungles, Camel Expeditions and Wilderness Lodges. 50 new tours every month to Australia 4 Tours. See our one day tours, trips and experiences. Short on time we can find you a cruise, experience or trip to enjoy the moment. 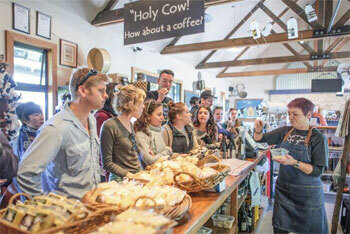 Take a small group short break accommodated tour from Melbourne to Adelaide. Or Melbourne to Alice Springs or Darwin. 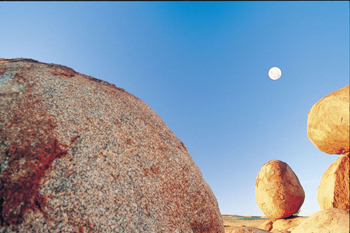 Take a small group short break accommodated tour from Adelaide and include Kangaroo Island or go north to Uluru. 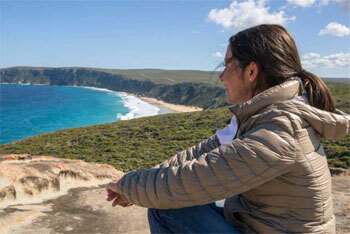 Take a small group of 24 like minded adventure travellers on a short break accommodated tour from Sydney one way. 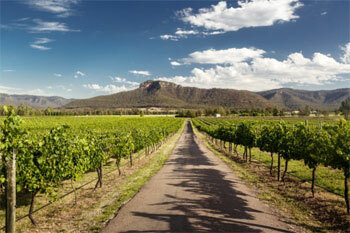 Take a short break with a small group on this adventure tour from Hobart to the top tourist destinations in Tasmania. 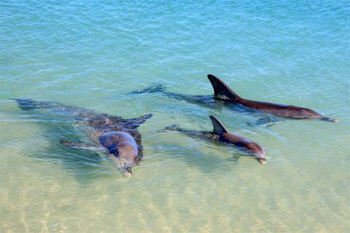 Take a short break on this adventure tour from Brisbane or Cairns one way, highlights like the Great Barrier Reef. 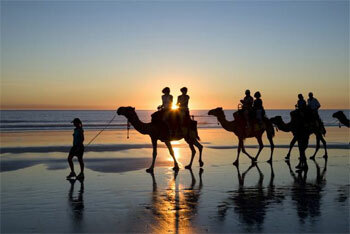 Hotel Bookings - Wotif is Australia’s favourite online travel destination. Wotif started in the early dotcom days in 2000. Todays it's one of Australia's most recognised brands for online travel agents. Great rates, wide range, easy-to-use site is popular for Australians to book their travel plans online. © 2004 Australia 4 Tours - All rights reserved. Copyright © - Australia 4 Tours for Uluru and Kakadu small group independent guided safari adventure camping tours. Book with the local booking specialist travel experts for over 20 years.